With the release of this website sub-page, all new orders (except from customers who previously ordered from me) will go through here. I no longer take requests on Smashboards or other messaging sites. If you had made an order request to me before that I haven't fulfilled yet and you still want to go through with the purchase, please let me know where and under which username in the contact formular's comment field. For every order, I charge a flat 20€ of service and insurance fee per controller. This is to make sure that I can always afford to repair your controller ordered from me. During the first six months after purchase, I do so entirely on my own cost, refunding your return shipping costs (up to 20€). After these six months, I charge a flat service fee of 20€ per controller plus 15€ of international tracked & insured priority shipping, regardless of what amount of modifications I re-work. In addition to the 20€ service fee, I charge a base controller price (depending on the model and condition as given below), prices for the individual modifications ordered and shipping costs (10€ + 5€ per controller). The purchase contract is established as soon as you have paid the invoice that I sent to your PayPal account's email address. From the date of payment, I finish and ship every order within two calendar weeks. Usually, it takes 1-2 more weeks afterwards for the parcel to arrive, so expect to have the controller no later than one month after making the payment. PayPal is the only payment method I accept, with the exception of bank transfer for EU citizens, for which I give a 2% discount since I don't have to pay PayPal fees that way. The deciding factor for the controller price is the PCB with its cable. Front and back shell colors can be exchanged for free, except for rare expensive colors like Emerald Blue (+10€ each per front or back shell of that color). Soldering on a different cord is also +10€. Every used controller is cleaned thoroughly so that it's free from grease and looks as close to new as possible (save for the unavoidable few scratches). 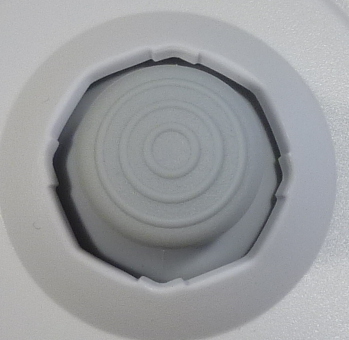 Click here to toggle a photo comparison of a used controller before cleaning and after cleaning. Options here change the way the control stick feels and responds in terms of mechanics. PODE usually makes inputs like pivots, backdash out of crouch and C-stick inputs less consistent. By opting to remove the present PODE, you avoid those issues. However, opting for S1 also means that the controller doesn't get high 1-frame backdash consistency on vanilla Melee, unless coupled with an Arduino installation, as that can then only be caused by PODE. Also, snapback will be present initially (until PODE develops), since that can only occur 'naturally' from PODE. So if you use aerial neutral-B at all, I recommend to couple this mod with S2b. When done for both potentiometers on both the control stick and the C-stick, the total price of S1a is 20€ (4*5€). S1a tends to remove PODE for about 2-20 months. If you have PODE issues on an axis that you bought S1a for, you can return it to me for servicing that will be covered within the 6 months warranty. By soldering in a new original black-type potentiometer, PODE is prevented for a longer time than with S1a, on average. Due to the rarity of the original black wiper potentiometers, replacement is a bit more expensive. S1b tends to prevent PODE for about 12-24 months. If you have PODE issues on an axis that you bought S1a for, you can return it to me for servicing that will be covered within the 6 months warranty. 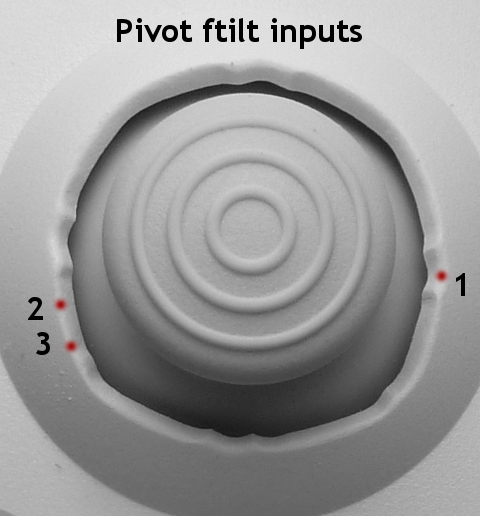 Due to the stick knob having physical mass, it's technically completely normal for there to be snapback when doing flick-type inputs. The controllers that don't have snapback without being modified only do so because of PODE (potentiometer degradation), which is a technical malfunction. [S2a][5€ per axis] SMD installation: Not user-serviceable (unless you have a soldering iron and are experienced in using it properly), permanent installation. Not generally recommended for this reason. [S2b][15€ per axis, 20€ for both horizontal and vertical] Modular female jumper wire installation: Easily user-serviceable, only a triwing screwdriver is required (added for free if you don't have one already). Only recommended for the horizontal axis potentiometer of the control stick. Here, you can then step up or down from the default capacitance I insert accordingly to the amount of snapback and PODE measured with my oscilloscope as PODE decreases or increases. For detailed information and instructions, please refer to the S2 information page. [S2c][25€ per axis] Double switch installation: Even easier to adjust for the user. I install two switches that toggle individual capacitors, so that 4 different configurations are present, for covering varying amounts of snapback and PODE. Has the advantage of not having to pull capacitors in and out, at the drawback of higher price. For controllers with type 1 or 2 stickboxes, I can solder in a new original type 2 white stickbox for +20€, lubricated with just a little bit of silicone grease so that it doesn't wear out as quickly. I always do so when the controller came with a type 1 stickbox, as those are inherently inaccurate with notch values. If you order an old black, purple or orange controller with its original T2 stickbox, it will be considerably looser than a new one in terms of control stick spring resistance. While I will not sell controllers with stickboxes so loose that they are no longer accurate, some people prefer the feeling of new stickboxes (high stickbox spring resistance helps with stick jump short hop and PC edgehog, for example). If you prefer a controller that feels like new bought in 2002 over more broken-in ones, going for a new T2 stickbox is the better choice. For controllers with type 1 or 2 stickboxes, I can solder in a new type 4 black stickbox for +10€, lubricated with just a little bit of silicone grease so that it doesn't wear out as quickly. The "type 4" stickboxes only recently surfaced, it's not yet clear whether these are original Mitsumi stickboxes or produced by a different factory. What is known is that the potentiometers the T4 stickboxes ship with are 100% original. Unfortunately, T4 stickboxes always seem to have a loose zone too large for the very high precision needed in Melee, especially when coupled with the A2 and A3 mods I offer. Because of this, I only recommend this service for controllers intended for Smash 4, Slap City or other games. Previously offered under the short-code [A0]. The stickbox used for the C-stick (type 3 black) has 20% lower spring resistance than the one used for the control stick (type 3 white). So if you like controllers with little disjointed zone, but also low initial spring resistance, which you usually get after breaking in a controller for a few months, starting with a T3B stickbox for the control stick might be a good idea to skip the breaking-in period. You should be aware that some techniques like stick-jump short hop and pivoting will be more difficult / require other timings with the S3T3B mod. The older stickbox designs can also be swapped by desoldering and resoldering them. These types also have black sub-types with lower spring resistance that are used for the C-stick by default. I only offer this for type 2 stickboxes though, type 1 stickboxes are too bad for anything else but the C-stick. Instead of replacing the stickboxes, it's also possible to cut off a part of the T3W stickbox spring in order to reduce its resistance, or to increase its resistance by stretching it. The maximum possible difference in spring resistance is about 30% in either direction. The amount of change you want is up to you, in multiples of ±5%. Example: [S4+10] would increase the resistance to 10% over what controllers are shipped with by default. Options here change the way the sticks move against the stick gates, in terms of re-aligning default notches and adding new ones. The hybrid gate shape I invented in 2015 is ideal in terms of preventing the control stick from reading dead-zone inputs when intending to hit the slight diagonal angles just outside of the dead zone, yet keeping the angles close to these 'perfect' ones equally accessible as with an unmodded stick gate. The hybrid gate is fully compatible with other gate mods like A3 (shield drop notches). I finish the notches properly so that on the first glance, the notches look just like they do on vanilla controllers. So if it seems to you that I simply forgot to add them, please try the controller out first and see whether it shield drops well before inquiring about this to me. These shield drop notches only work in Melee. Not in Project M, not in Smash 4. When you order this mod, the hybrid gate mod has to be reduced / altered somewhat. I will add notches that allow for quick targeting to trigger a forward tilt out of smash turn and are as close to the shield drop range as possible. In other words, the shield drop notches will be expanded a bit to also function as pivot ftilt notches, depending on input type and movement strength. For characters that can angle their forward tilt, this will always trigger a down-angled forward tilt. Only Popo will dash, not Nana. Done by adding notches slightly above SE and SW, y value of -0.8. Will take longer to do since this needs to be super-accurate. When this is elected, hybrid gate mod has to be reduced somewhat. This technique requires single value range precision. Even if I align the notch perfectly, it will still be hard to perform it consistently, since you need to both press the stick from the correct direction and, in case your control stick has a loose zone greater than 1, calibrate it properly. So in any case, this will work less consistently / require more precision to work consistently compared to shield drop and A2 notches. I move the NE and NW notches slightly to the sides so that hitting these angles will only cause Popo to jump. This technique requires single value precision. Even if I align the notch perfectly, it will still be hard to perform it consistently, since you need to both press the stick from the correct direction and, in case your control stick has a loose zone greater than 1, calibrate it properly. So in any case, this will work less consistently / require more precision to work consistently compared to shield drop and A2 notches. A7b. Ice Climbers dash solo-jump notches: With this subtype, the main Ice Climber will dash for one frame and then jump, while the other one will only walk and not jump. This has a value range of two, so it's a bit easier to perform than the default version of A7. A8a: left and up as well as right and down are fsmash, left and down is dsmash, right and up is usmash. A8b: left and down as well as right and up are fsmash, left and up is usmash, right and down is dsmash. C-stick modification. Adds notches to the C-stick where angled smash attacks are triggered (only with characters that have these, like Samus, Captain Falcon, Ganondorf etc.). This eliminates lightshielding in L / R. Can be useful for powershielding, but is bad for L-cancels since they’ll interfere with airdodges and teching. Not recommended for solo-trigger use. B2a is known to cause problems on Wiis and Wii Us which don't have Native Control enabled in Nintendont. On vanilla Gamecubes and Wiis or in Nintendont with Native Control enabled, B2a does not cause any problems. Inserts a spacer to decrease the amount of movement necessary until digital press. The idea is similar to B2a, but this will elevate the digital press point instead of lowering the neutral trigger position. This is generally recommended if you have rather long fingers and don’t want to claw as much for pressing L / R.
By default, I keep 20% of the original analog range, so you can still soft-press L-cancel and lightshield. If you want a different percentage remaining, please specify so. Makes it impossible to lightshield for that trigger. Recommended if you don’t use one of them at all but press them accidentally occasionally, or if you want to have one of the triggers as a dedicated digital-only button. Always added when B1 is ordered for that trigger to prevent accidental lightshield. Recommended with Smash Edition 2014 and JP 2008 controllers. These tend to have triggers that get stuck; lubing the tubes with special silicon oil often helps to remove this problem. 1€ per trigger. Can also be done for ABXY buttons (24€ in total if you want all rubber plate buttons (ABXYLR)). I measure all click resistances with analog tension gauges and save them into a table for future referencing when you order B5. Removes a part of the spring to reduce analog spring force. This will decrease the amount of force necessary to pass through the analog L / R press zone or to get to the digital Z click. Can make powershields slightly easier (only for L and R of course). By default, I aim for 100 gf analog resistance, with the original one varying between 120-140 gf from controller to controller. Other specific resistances are possible too, please specify in the format B6L110 (example: 110 gf on left trigger). Sometimes preferred for the Y button if you do inputs on it in a “sliding” way. The photo comparison that shows the difference this mod makes. Ergonomically ideal for the Y button if you do inputs on it in a “sliding” way between Y and B. Reshapes both A and Y. Useful for thenar grip (doing aerials with the bottom part of your thumb on the C-stick). Your original C-stick knob will be in the box too, of course. With every modification that requires occasional internal adjustments by the user, you can either get the cheaper one for free or the higher quality one for 3€. In the picture, you can see how they differ. The high quality one has a more sturdy tip and a more comfortable handle that makes it much easier to take the screws out quickly. Depending on the ruleset used at the tournaments you attend, some of these options might be banned. Please make sure you always check back with the TO in case the ruleset wording isn't clear on this. Assigns a physical button to a different in-game button press. I can also assign light-press L / R to digital inputs or digital buttons to specific analog inputs. This is a bit more expensive because more work is involved, so it's 20€ instead of 10€ then. Note that digital→analog inputs will only work if the control stick is in neutral position while pressing the button. Specify in this way: E1[light press R press causes Z input, A press causes Y input]. With E1[full press R causes analog press R], you can make a controller use the click input of the controller for shielding and airdodging in Smash 4. Installation of an Arduino with a switch that allows completely disabling the Arduino. When the switch is flipped to off, the controller will function 100% like if the Arduino wasn't there, which can be easily told by the Arduino's lights not even being on. 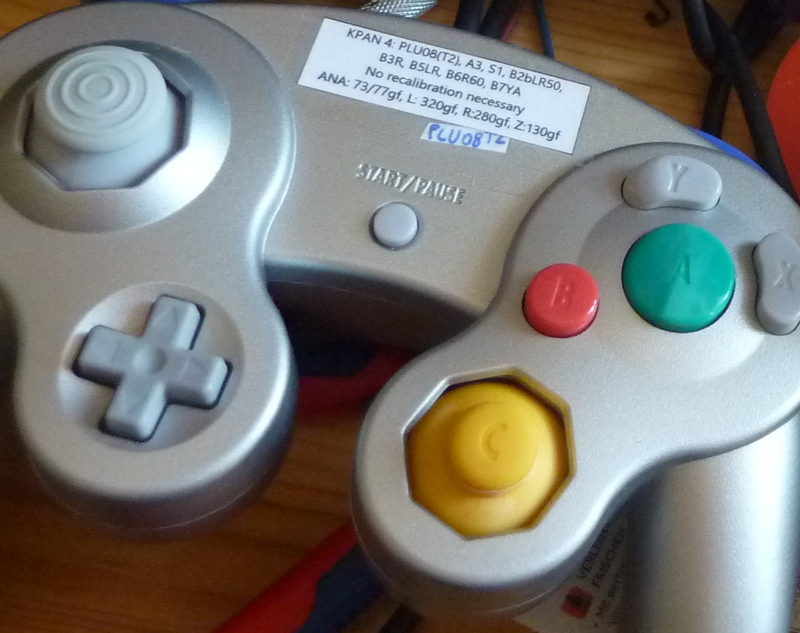 Other things I offer that are not directly related to Gamecube controllers, but somewhat tangentially related and might be interesting to you as well. The Mayflash VGA 005 is one of the lightest and most practical ways to get 480p VGA signals from your Wii. It's currently out of stock everywhere, however I still have a few pieces in overstock where I have already replaced a capacitor to fix the problem it has by default (going black for a second or two whenever the in-game picture transitions from bright to black). Prevents sweat stench from bacterial apocrine sweat break-down for 2-5 days (or less if you wash the cream off earlier). Useful for preventing body odour even when at a tournaments where showering is not possible or practical (due to long queues or distances, for example). For more details, please refer to the subpage. Offered with different scents (perfume oils) or, alternatively, without any scent (faint smell of the natural oils used then). Available in different consistency editions: Spring, Summer, Fall and Winter. The consistency will be ideal for the respective edition, for example the Summer edition will be just right at about 24-30°C room temperature, but tend to be too hard in cold rooms in the winter (16-20°C). If you only order deodorant, the shipping cost is roughly half of what it is for one controller (will update this after sending them out for the first time). With the addition of the 20€ service fee, the total price for this controller would be 239€.